Representing the SLFP, former General Secretary of SLFP Prof. Rohana Lakshman Piyadasa, the current General Secretary MP Dayasiri Jayasekara, and MP Thilanga Sumathipalahave arrived at the meeting while Chairman of SLPP Prof. G.L. Peiris and MP Dullas Alahapperuma is set to represent SLPP. Although the Opposition Leader Mahinda Rajapaksa is set to attend the meeting, he has not arrived at the premises as of yet, stated Ada Derana reporter. 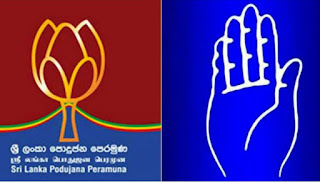 Earlier, MP Dayasiri Jayasekara stated that today’s (14) meeting will focus on the future political activities of the two parties. He added that the SLFP will attend the meeting with an open mind.